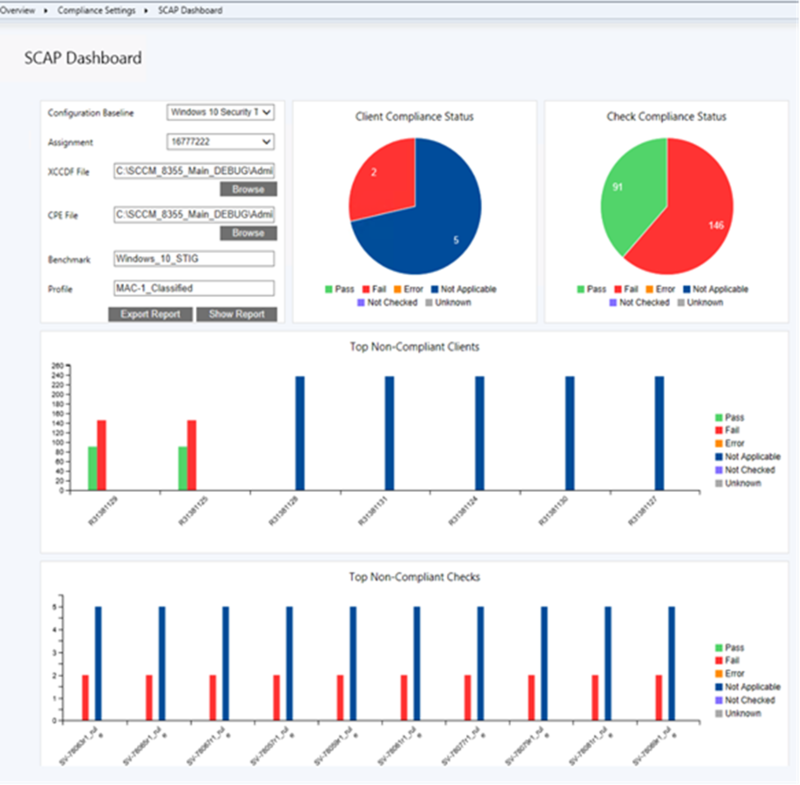 First create the device collections for the computers that you want to assess for SCAP compliance. For more information, see Create collections. Now you're ready to deploy the configuration baselines that you imported to these device collections. For more information, see How to deploy configuration baselines. Repeat this process for each configuration baseline that you want to deploy to each device collection. At a minimum, deploy each configuration baseline to at least one device collection. Before exporting the compliance data back to SCAP format, you need to verify that the site has collected the data. After you deploy a configuration baseline to a device collection, the Configuration Manager client on each computer in the collection automatically gathers the compliance information. Then the compliance information is stored in the Configuration Manager database. View the status of the configuration baseline deployment in Configuration Manager to ensure that the appropriate data has been collected by the Configuration Manager clients. It's important to verify that the appropriate compliance data has been collected in Configuration Manager because it can help you validate the XCCDF/DataStream results files that you create later in the process. For more information, see Monitor compliance settings. In the Configuration Manager console, go to the Assets and Compliance workspace, expand Compliance Settings, and select the SCAP Dashboard. Select the configuration baseline, Assignment, SCAP File, Datastream, Benchmark, and Profile (if applicable). The next step in the process is to export the compliance data to SCAP format, which is an ARF report file in XML/human-readable format. 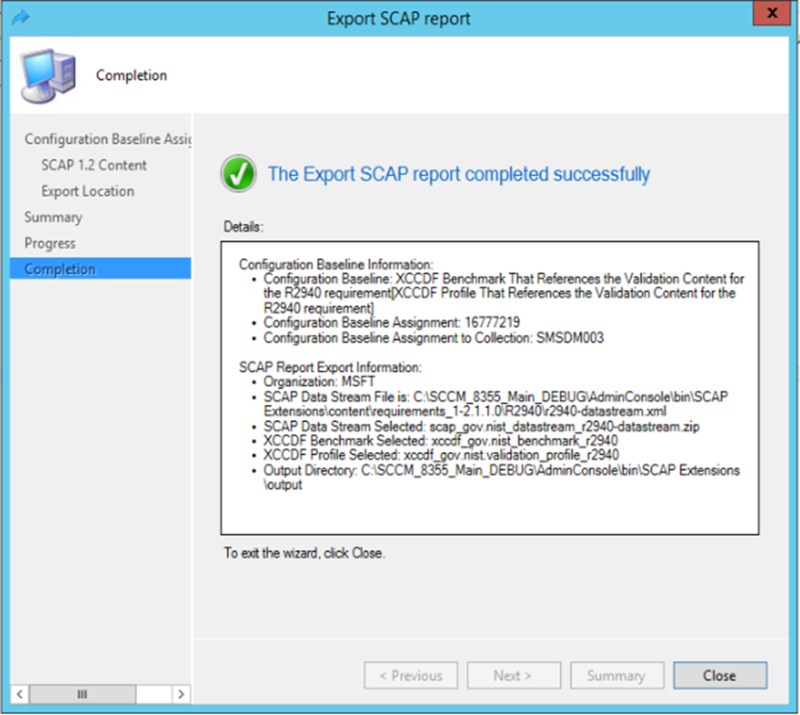 The SCAP Extensions Export wizard and Microsoft.Sces.DcmToScap.exe command-line tool export a separate XCCDF/DataStreamARF results file for each configuration baseline. 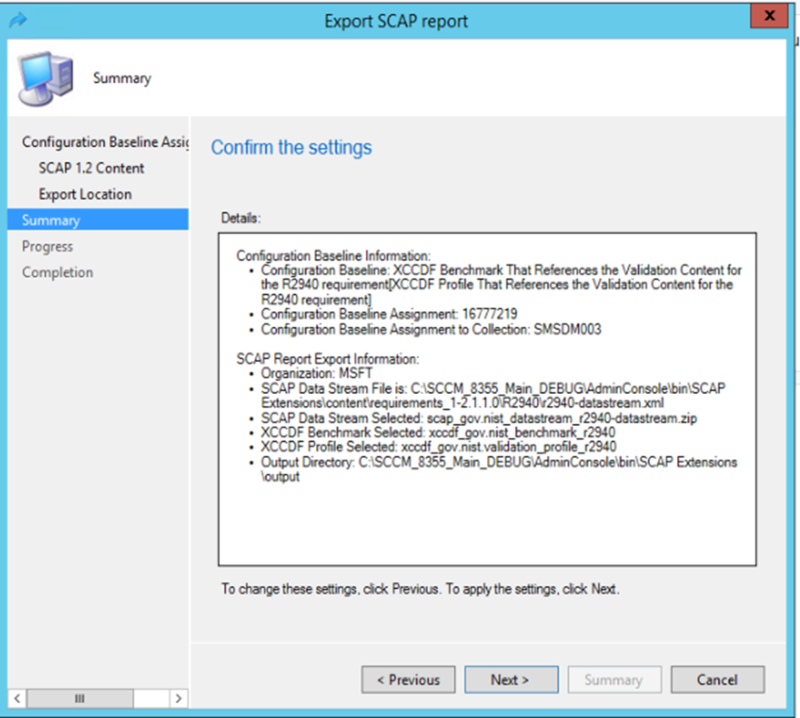 These files correspond to each XCCDF/DataStream input file that the Microsoft.Sces.ScapToDcm.exe tool uses to create each configuration baseline. This section describes the manual process to export the compliance results with the Configuration Manager console. To automate this process, see the next section to Automatically export with the command-line tool. 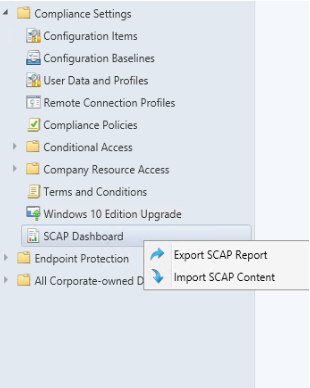 Start the Export SCAP Report wizard by right-clicking the SCAP Dashboard node. 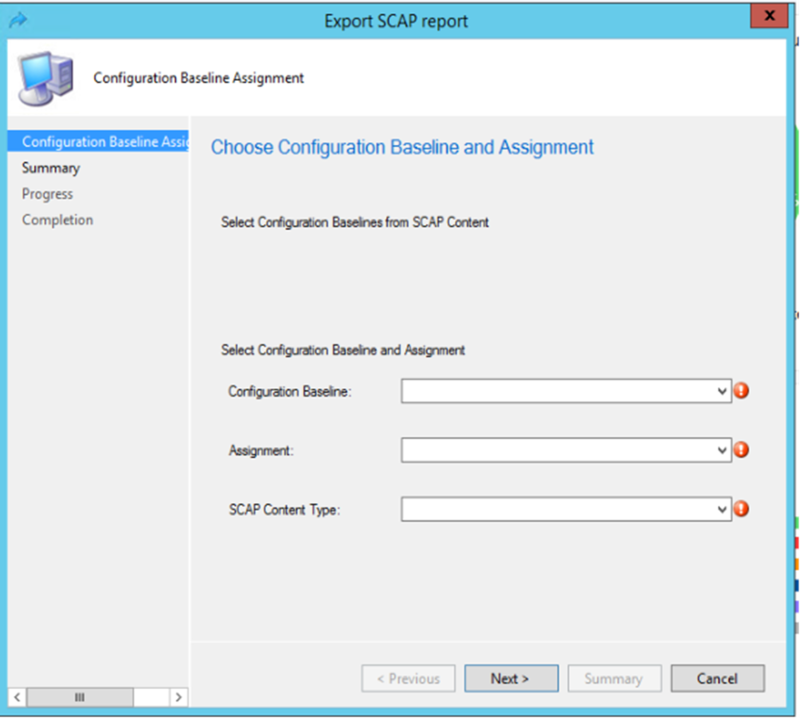 Select the Configuration Baseline, Assignment, and SCAP Content Type. 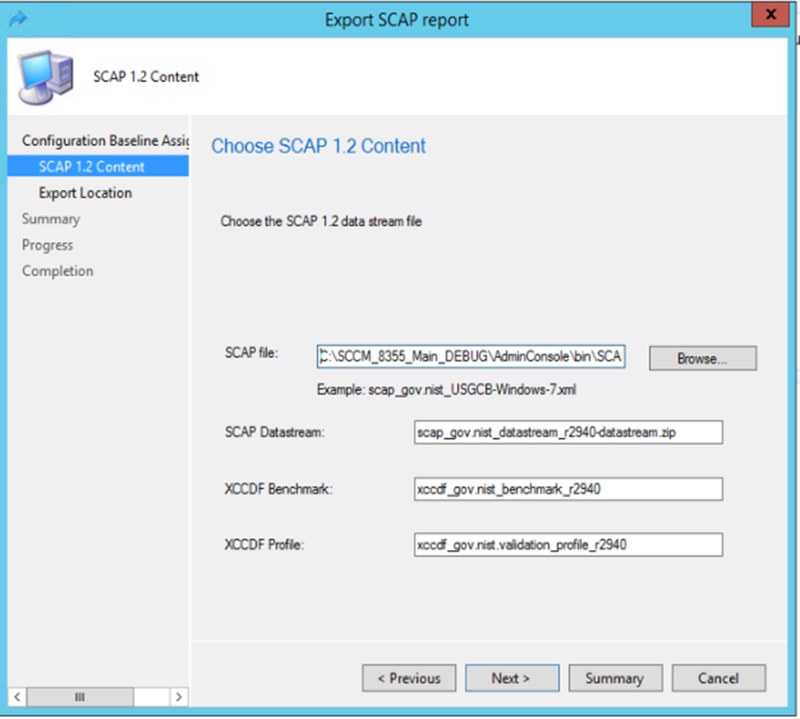 Choose the location of the SCAP datastream file, XCCDF/CPE file, or Oval content and variable files. 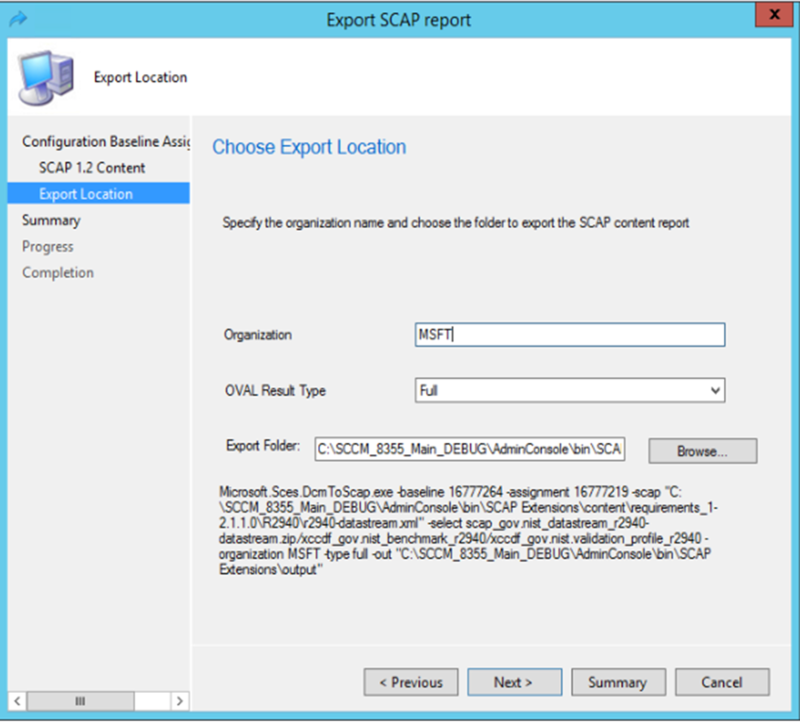 Specify the organization name, and choose the folder location to export the SCAP report. This page of the wizard displays the command line you would use with the DcmToScap.exe tool to automate the same process. Choose Next to export the report. Complete the wizard. Your account must have read permissions for the Configuration Manager provider. You also need write permissions for the folder specified in the –out parameter of the command line. If there are multiple benchmark/profile in the content, use the –select parameter to specify the benchmark/profile which has been evaluated on the clients. If there are multiple datastream/benchmark/profile in the content, use the –select parameter to specify the datastream/benchmark/profile which has been evaluated on the clients. The Microsoft.Sces.DcmToScap.exe only generates OVAL definition results report for each target machine. The ARF report isn't generated. In the Configuration Manager console, go to the Assets and Compliance workspace, expand Compliance Settings, and select Configuration Baselines. The BaselineCIID is the identifier (ID) for the configuration baseline. Select the desired configuration baseline, and click the Deployments tab. The AssignmentID is the identifier (ID) for the configuration baseline deployment to a device collection. If the Assignment ID isn't displayed, right-click the column header, and select Assignment ID. You can specify the -?, –h, or –help parameter to display the syntax of the Microsoft.Sces.DcmToScap.exe tool and a list of the parameters. By default, the Microsoft.Sces.DcmToScap.exe tool accesses the Configuration Manager database using your credentials. The Microsoft.Sces.DcmToScap.exe tool requires a minimum of read access to the Configuration Manager database.